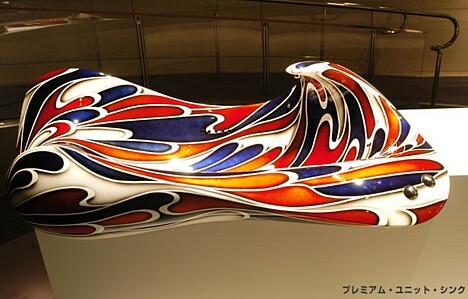 Artist Tetsuya Nakamura�s Premium Unit Series of curvaceous, luxury bathroom fixtures -- a tub, a pair of sinks, a step designed for insertion into a stairwell, and a decorative column -- are sculpted from fiber-reinforced plastic and painted with colorful, fluid patterns meant to evoke a sense of speed. 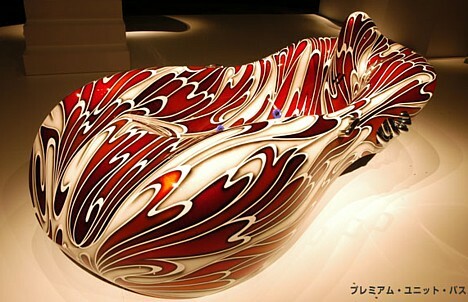 Nakamura, who created the Premium Unit Series with the DIY-er in mind, encourages the purchaser to add his or her own custom paint job, body modifications and part upgrades, despite the 3 million yen ($26,000) cost of the tub and 1.5 million yen ($13,000) price tag on each of the other items. According to the accompanying disclaimer, Nakamura's heavy emphasis on form -- and relative disregard for function -- means bathers should enter the tub at their own risk, as the artist and dealer assume no responsibility for injuries or accidents that may occur. Very cool! 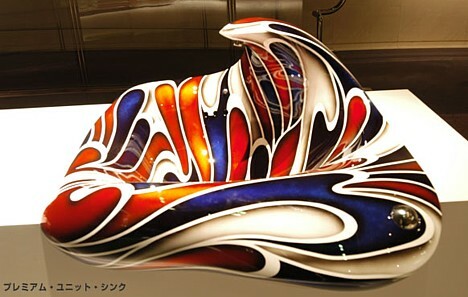 This is the most innovative thing I've seen in a bathtub in years... colorful, lovely fluid design, easy to clean and gorgeous shapes. They beat boring white porcelain anyday!! My kudos to the designer... Bravo! I loved da design,really interesting,and da vibrant colors and there combinations are just sooooo amazing! Trend Squad » Blog Archive » Hot-rod bath � It�s all about aesthetics and speed! Fred’s Cabin in the Woods » Check out these wild tubs and sinks.